thebahamasweekly.com - Ride for Hope wants YOU to help Design-a-Jersey! Ride for Hope wants YOU to help Design-a-Jersey! Ride for Hope Bahamas, a registered Charity in The Commonwealth of The Bahamas, was formally constituted in 2009. It was established for the purpose of raising money to support initiatives related to health, wellness and human development in The Bahamas. Ride for Hope’s designated focus is cancer. The organization’s flagship fund raiser is “The Ride for Hope” - now a seven year old bike-a-thon held each Spring on the island of Eleuthera. Without exception, every dollar raised by participants is applied to program support. Calling all graphic artists! 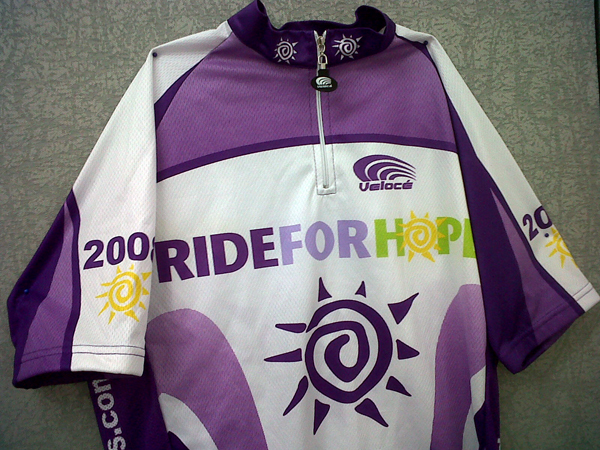 Ride for Hope is inviting artists in the community to help design their Ride for Hope jersey for 2012. Ride for Hope Bahamas (R4H) is gearing up for its 7th annual bike-a-thon which will be held on April 14, 2012 in Governor’s Harbour, Eleuthera. Traditionally, R4H designs jerseys for the event every year, and they vary fairly slightly in the overall look. This year, they are taking a more fun, artistic approach. R4H is looking for a design that is a lot more colourful and creative, and would like to engage the keen and capable artists in the community. Designs should be sent, as PDFs, to info@rideforhopebahamas.com by January 6, 2012 at 3pm with “Jersey Design Submission” as the subject. The winner will be announced on January 13, 2012 and will receive a very special surprise RFH gift.